What she meant to the Minoans who made her is not very well understood. 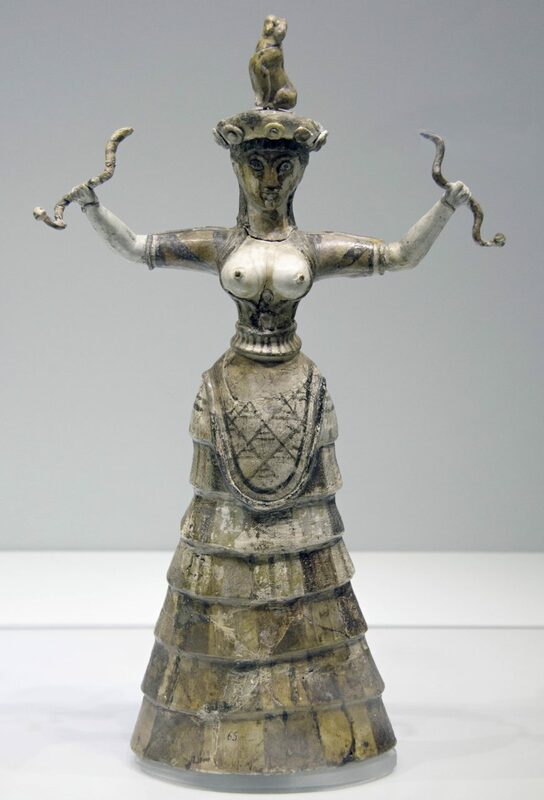 It has been said that the image of the Snake Goddess, discovered by Sir Arthur Evans at Knossos on Crete, is one of the most frequently reproduced sculptures from antiquity. Whether or not this is true, it is certainly the case that she is a powerful and evocative image. What she meant to the Minoans who made her, however, is not very well understood. Evans found the sculpture of the Snake Goddess in a secondary exploration of the complex he called a “palace” at Knossos. After digging out the entire western wing, he decided to check under the paving stones. Most covered nothing but earth, but just south of the Throne Room, he discovered two stone-lined pits containing a wide variety of precious things, mostly broken: scraps of gold, ivory, faience (the largest deposit of faience on Crete), stone inlay, unworked horn, ceramic vessels, seal stones, sealings, shells, the vertebrae of large fish, and the broken pieces of at least three figurines, of which the Snake Goddess was one. Because of the fragmentary nature of these valuable objects, Evans assumed what he had found were damaged pieces that had been cleaned out from a temple. 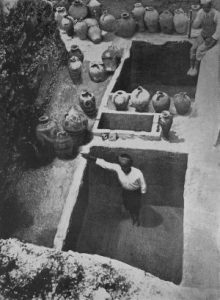 He named the pits the “Temple Repositories” and immediately set upon the reconstruction of as much as he could, with special interest in the figurines, which he assumed were of goddesses. The Snake Goddess, as originally excavated, lacked a head and half of her left arm. The complete right arm held a short wavy striped stick, which Evans interpreted as a snake. This was, in some measure, to match the other nearly complete figurine found in the Temple Repositories, which clearly had snakes slithering up both of her arms. The restoration of the Snake Goddess was done by the Danish artist Halvor Bagge together with Evans. 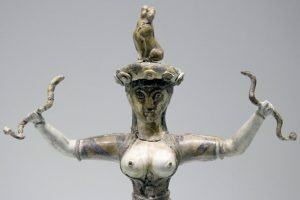 Their contribution to the figurine was the creation of a matching arm and stripy snake, the head of the goddess, and the placement of the hat and cat (separate faience pieces found in the Temple Repositories) on her head. 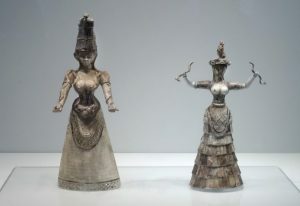 In her restored state, the Snake Goddess is 29.5 cm (about 11.5 inches) high, a youthful woman wearing a full skirt made of seven flounced layers of multicolored cloth. This is likely not a representation of striped cloth, but rather flounces made from multiple colorful bands of cloth, the weaving of which was a Minoan specialty. Over the skirt she wears a front and back apron decorated with a geometric diamond design. The top of the skirt and apron has a wide, vertically-striped band that wraps tightly around the figure’s waist. On top, she wears a short-sleeved, striped shirt tied with an elaborate knot at the waist, with a low-cut front that exposes her large, bare breasts. 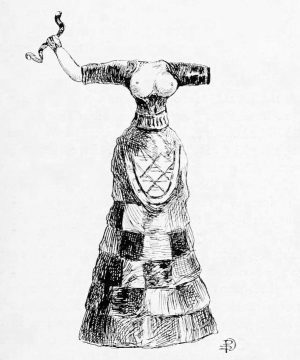 The Snake Goddess’s head, restored by Bagge and Evans, stares straight forward, topped by the spherical object that Bagge and Evans believed would make a good crown, and, finally, a small sitting cat. Her long black hair hangs down her back and curls down around her breasts. The Snake Goddess is a provocative image, but its restoration and interpretation are problematic. The crown and cat have no parallel in any image of a Bronze Age woman, so these should be discounted. 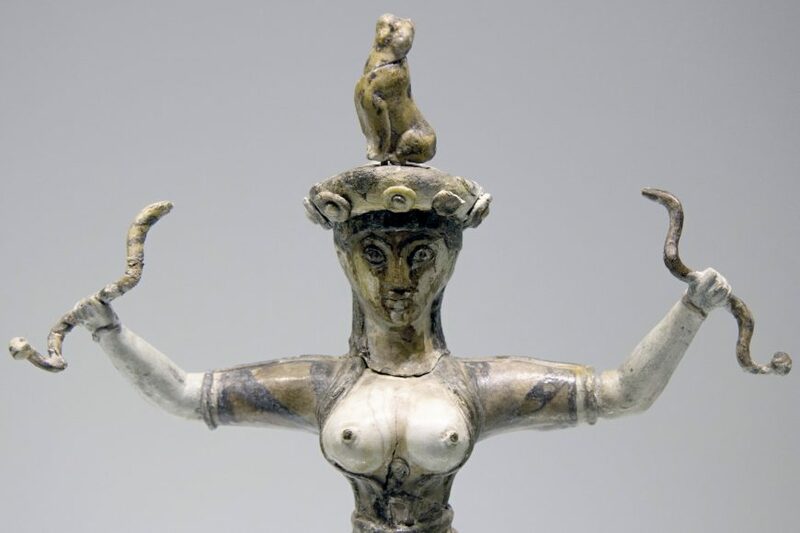 The interpretation of this figure as a goddess is also difficult, since there is no evidence of what a Minoan goddess might have looked like. Many images of elite Minoan women, perhaps priestesses, look very much like this figurine. If it is the action of snake-wrangling that makes her a goddess, this is also a problem. The image of a woman taming one or more snakes is entirely unique to the Temple Repositories. Therefore, If she is a snake goddess, she is not a particularly popular one. 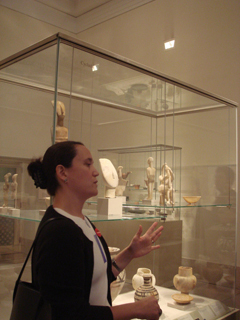 Certainly, Evans was interested in finding a goddess at Knossos. Even before he excavated at the site, he had argued that there was a great mother goddess who was worshiped in the pre-Classical Greek world. With the Snake Goddess, Evans found—or fashioned—what he had anticipated. Its authenticity and meaning, however, leave many questions today.